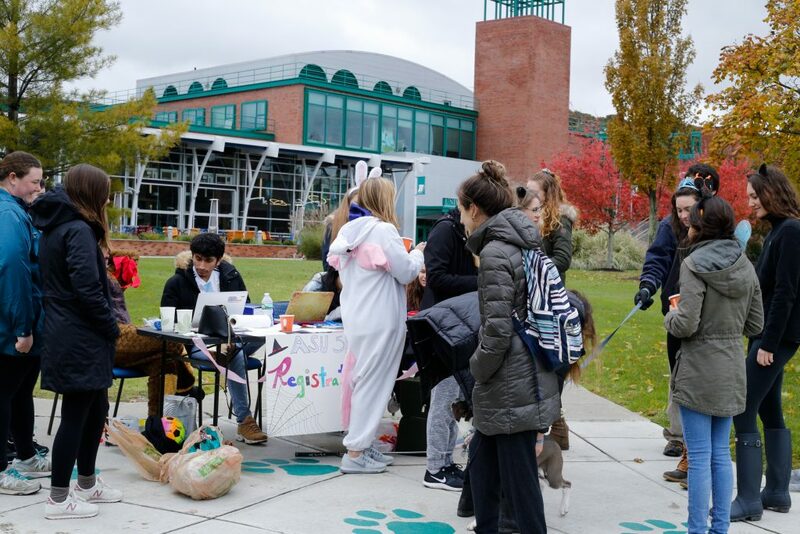 Donning costumes of characters from “Monsters, Inc.,” “Space Jam” and other children’s movies, students gathered at the Peace Quad to raise awareness of people with autism at the first Spooktacular Walk on Sunday afternoon. Hosted by Binghamton University’s chapter of Autism Speaks U, a national organization that works to engage college campuses and communities through awareness, education and fundraising, the walk required participants to pay a $5 registration fee. They had the option to participate in a 5K or walk around the Peace Quad while trick-or-treating for candy. Alyssa Goodman, the vice president of Autism Speaks U and a senior majoring in psychology, said Halloween can be especially anxiety-inducing for people with autism or those on the spectrum because it can be overstimulating. According to Autism Speaks’ website, those with autism can experience hypersensitivity to stimuli involving the five senses. The website also states that many people on the spectrum are hypersensitive to bright lights and certain sounds are overwhelming. Halloween, a holiday aimed around being scared for fun, can pose a problem. Goodman noted the event was planned so community members could trick or treat safely or practice trick-or-treating so they would be ready for Halloween. According to members of the group, loud noises such as kids running around excitedly, scary decorations and new experiences such as going to strangers’ homes could overwhelm children with autism, making Halloween less fun for them. Kerri Percoco, the president of Autism Speaks U and a senior majoring in psychology, said kids also find themselves speaking to strangers while trick-or-treating, which can overwhelm a child with autism. “When I was younger and trick-or-treating, people would always want us to say ‘trick or treat,’ but some people with autism cannot speak,” Percoco said. Emily Blank, the event coordinator and a sophomore double-majoring in psychology and human development, said she was looking forward to collaborating with the local community. “I was most excited for people from the community coming and participating,” said Blank. According to Percoco and Goodman, the group plans to use the funds raised from the event to fund their club and plan future events.